Ancient Stones - Lothian - 048 Chapel Stone, Penshiel, Cranshaws. The Chapel Stone is the only erect stone in a setting of four large stones that may once have formed a stone circle. 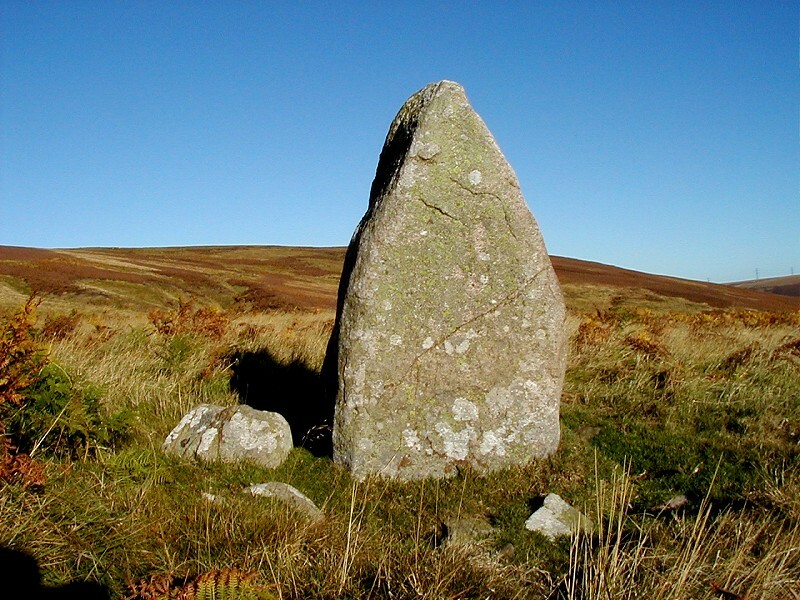 The Chapel Stone, it's the name taken from the supposed remains of Penshiel Chapel and Chapel Cleugh nearby, measures 1.30m high, 0.60 x 0.66m on plan and is a distinct wedge shape. The base is well packed with smaller stones. Three other recumbent stones can also be seen with the longest measuring just under 1.00m long. From the B6355 running between Gifford and Cranshaws, leave your vehicle at the cattle grid to the north west end of Whiteadder Reservoir. Follow the single track road on foot or by bicycle towards Penshiel and Priestlaw (also marked as Herring Road). 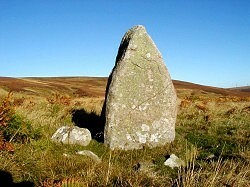 The Chapel Stone can be seen on the right not long after Penshiel. On verge by cattle grid at sign for Whiteadder Reservoir. There is a sign stating that vehicles are not permitted along the single track road to Penshiel but you could always ask! Thick mist and drizzle did not make this an enjoyable site to visit. In fact, the stone, which stands only a few metres from the track, could have been easily missed in the poor visibility. However, despite the damp conditions the site is well worth a visit (at least in good weather!) and the area does seem to suggest this is more than just a solitary standing stone. The Stones name, St. Mungo's Well and the nearby Chapel Cleugh appear to suggest religious connections and this may have been a pagan site prior to Christianisation. The remains of another stone circle 049 can be seen not far to the south west and numerous large boulders can be seen along many of the field boundaries in the area. Although these are probably the result of field clearance, one does wonder if other megalithic structures once stood in the vicinity?